In the history of machine tools, spindles have been very good relative to other bearings and structures on the machine. So Quality professionals have developed a cache of tools – like ball bars, grid encoders and displacement lasers – to help them characterize and understand the geometry of the whole structural loop. This makes sense, as this is where the majority of the errors could be found. But as machine tools have improved in their capability and precision, and the demands of part-geometry and surface finish have become more critical, errors in spindles and rotating work tables have become a larger percentage of the total machine error. This is especially true in the manufacturing of gears and bearings because small errors in the work and wheel spindles have large effects on part profile and surface finish. Once you have done all you can to improve the stiffness, damping, geometry and thermal stability of a machine, and the machine operator is using the best machining practices, the next frontier is to study the errors in the spindles. The ultimate roundness and surface finish that may be achieved by a precision metal-cutting machine tool is determined by the performance of its spindles. By characterizing and routinely checking spindles, part quality can be predicted and controlled. 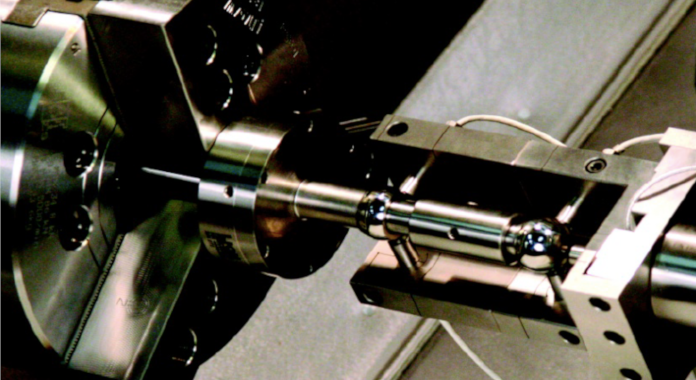 The focus of this article is to summarize the groundwork already established for using spindle metrology to deterministically improve manufacturing processes. As a bonus, and something the pioneers of spindle metrology would all be quick to point out, is that spindle testing, which is defined in the standards now as “tool to work,” is also an excellent new diagnostic tool for other error sources in the machine. Most importantly, these standards are the standards that are used to qualify roundness and gear measuring machines and so offer needed insight into manufacturing equipment as we try improve the quality of bearings and gears. The Standards which most-specifically refer to the quality of precision spindles are: ISO-230-7, “Geometric accuracy of axes of rotation” and ASME B89.3.4-1985, “Axes of Rotation, Methods for Specifying and Testing.” These standards are based on the concept of an “axis of rotation,” which is defined as a line segment about which rotation occurs. Spindle “run out” is an often-used term, but it is not consistent with standards for describing spindle precision. Surfaces have run out; axes have error motions. There are three basic spatial error motions in spindles: Radial, axial and tilt (Figure 1). We will see later that spindle error motions are also characterized by frequency and by sensitive direction. Over the last 50 years, Axis of Rotation Metrology has developed into a standard for characterizing spindles and understanding the capabilities of a machine. The measurement technique involves high bandwidth, non-contact capacitive sensors with nanometer-level resolution. The sensors reference precision pins or spheres that are mounted to the rotating spindle as targets. So with a three-probe system, (two probes arranged radially at 90° from each other, and one axially centered on the axis for X, Y and Z), a point may be referenced in 3-D space. A five-probe system (Figure 2) with two spherical targets may reference two points, and so tilt errors of the spindle may also be known. What we find in the data, after subtraction of eccentricity, is that some errors are Asynchronous; that is different every time around. 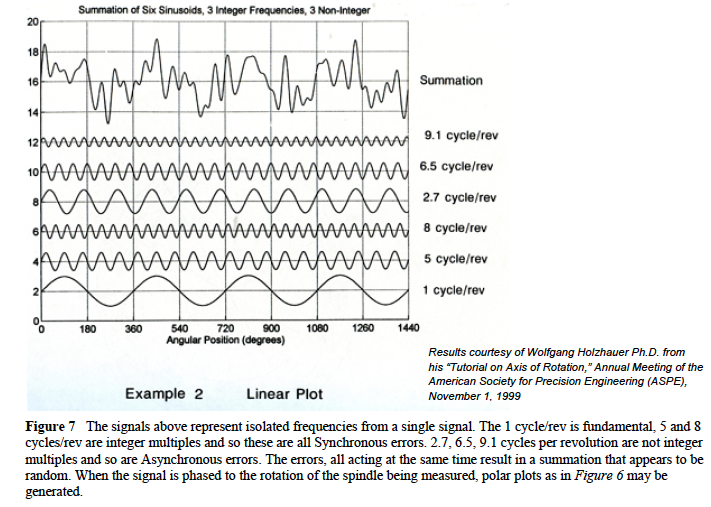 If we average the Asynchronous data we have what is called Average Error (per the ASME B89.3.4-1985) now called Synchronous error by the ISO 230-7, and defined as the portion of the total error motion that occurs at integer multiples of the rotational frequency (See Figures 4, 5 and 6.) We will see that asynchronous errors are a main determinant of work-piece surface finish, and synchronous errors are the main determinant of work-piece geometry. After subtracting out the eccentricity mentioned above, and averaging asynchronous motions, we have what’s called “Synchronous Error Motion.” In most cases this would be considered the spindle error motion. In cases of very high precision spindles, where the 25 or 50 nanometer errors in the target become a significant percentage of the total error motion, another measurement procedure called “Donaldson Reversal” may be employed to subtract out the errors that are in the target. 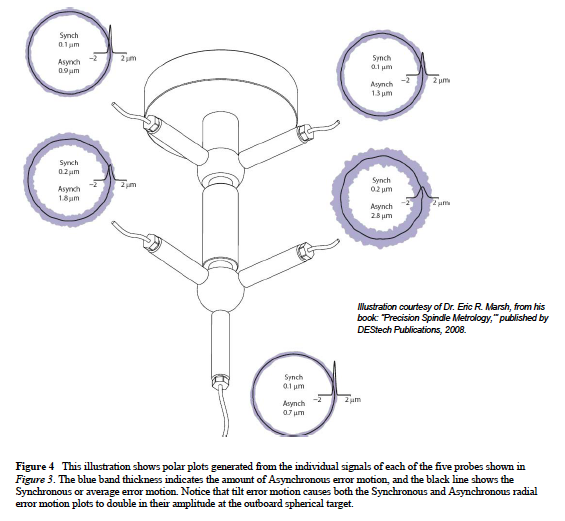 Synchronous (average) error motions are a predictor of how round a hole can be bored or turned with the spindle. So, for example, the synchronous errors of a spindle used to bore bearing seats for other spindles will be the determinate of the roundness of the bearing seats. The roundness of that bearing seat will affect the precision of the manufactured spindle. 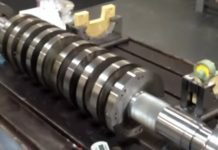 So the use of spindles with very low Synchronous error motion for boring bearing seats could dramatically improve the precision of the spindles being manufactured. This principle also applies to how round a gear may be made and because synchronous error is an average and gear manufacturing processes often employ fewer revolutions, significant process variations are possible as asynchronous errors have only a few revolutions to averaged over. We will see below that asynchronous errors are often many times larger then synchronous errors. Synchronous (average) errors are clearly illustrated in plots of air and hydrostatic spindles as the error repeats exactly, every time around. (See Figure 5.) This is, in large part, due to the fact that there is just one rotating element. Error motions in air bearing spindles are often less than 25 nanometers (or one-millionth-of-an-inch). In such a case, Donaldson Reversal would be a necessary methodology as the error motion of the spindle is likely less than the non-roundness of the target. At higher speeds, unbalance, which results in vibrations that you may think would affect surface finish, actually do not. Unbalance causes a once per revolution disturbance that is repeatable. It is a synchronous error. If you have a gear that is not balanced on the work table and you finish the inside diameter, it may have good surface finish and roundness but when you slow the spindle down the whole will be eccentric. With capacitance probes it is possible to measure the eccentricity (run out) of the turned surface at different speeds. With perfect balance, the radial load on the spindle does not change with speed and so there would be no run out at any speed. In a different situation, the unbalance of a grinding wheel spindle will have a surface finish effect determined by the relative speed of the spindle and work piece. Fundamental synchronous and asynchronous axial motion is measured on the axis of rotation. It is very important when flatness or form at the center of the part is critical. This would be the case in manufacturing optics. The face motions are measured some noted distance from the center, and would be the same as the axial motion in the absence of tilt motion. These errors would be evident on large diameter conical gears. Because they are both measured on the face, both are axial motions and so they cause flatness or profile errors when facing flat or conical parts. However, fundamental axial face motions will create a part that has the property of circular flatness, that is, the overall surface is not flat, but provides a “flat sealing surface” at any given radius. If you were to put the part on a roundness checker, and measure flatness at some radial distance from the center, you could adjust the part into reading flat at that radius, but the flat surface will not be perfectly square to the axis it was turned on, or the reference surface the part was chucked on. This may be acceptable for a sealing surface, but it would not be a good thing for a bearing surface or gear interface. 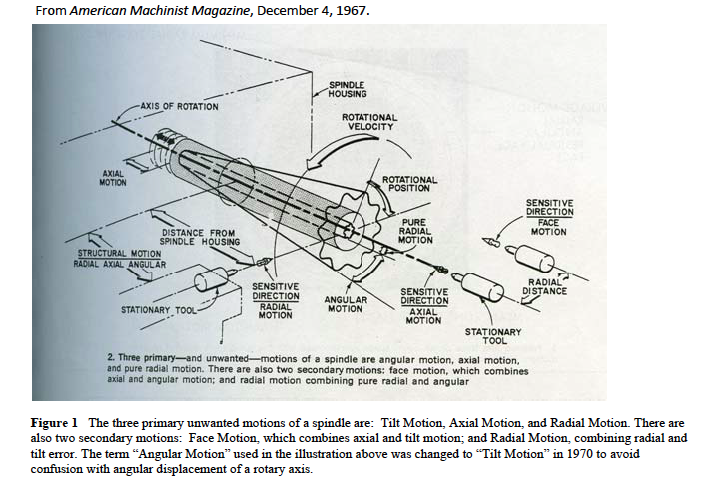 The utility of measuring error motions in spindles became evident as hydraulic systems were being applied to military aircraft. Leaky hydraulic fittings were a maintenance headache and a fire hazard. A study by the military to improve the effectiveness of taper seals revealed that residual face motions of spindles making tapered seals would compromise the geometry of the tapers produced and its ability to seal. Bevel gears are very similar to conical seals but as they have larger diameters the amplitude of the errors will be larger. Residual synchronous face motions are motions left over after the fundamental (the once around) errors are subtracted; they are still synchronous but are at other integer multiples of the rotation frequency. Residual face motions result in parts that are not flat at all, not even circularly flat. Controlling the property of residual face motion is critical whether you are making seals or bearing races and, because tilt is involved, this is especially true with large diameters. As noted above asynchronous error motions are a predictor of surface finish, and are best illustrated in error motion plots of rolling-element bearings. Because rolling-element bearings have “constituent elements” (rollers, inner race and cages) that are not perfect and have different rotational frequencies, error motions of the spindle appear random. They are not actually random, the determinist view point is that they can be predicted. In rolling-element spindles, these asynchronous motions are generally much larger displacements than the synchronous motions. (See Figures 4, 5 and 6). Over many revolutions, the polar plot develops into a fuzzy band and the thickness of this band represents the asynchronous error motion of the spindle. 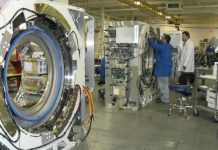 This is likely to be 100 nanometers in the very best rollingelement spindles; 1000 nanometers (1 micron) in good spindles; and 10 microns or more in 500mm or larger diameter bearings. This is why gear manufactures may see variability in gear teeth profile errors when a large gear is ground or gashed using only a few revolutions. The linear plot (See Figure 7) shows how the different elements, with their different rotational frequencies, produce what appears to be non-repeatable motion in the summation of their signals (top). The portion of the signal that is asynchronous is the determinant of surface-finish capability. The error motions do repeat though after many revolutions, and can be predicted.. An analogy can be made with the sun, which rises differently each day but is, after many rotations, repeatable. 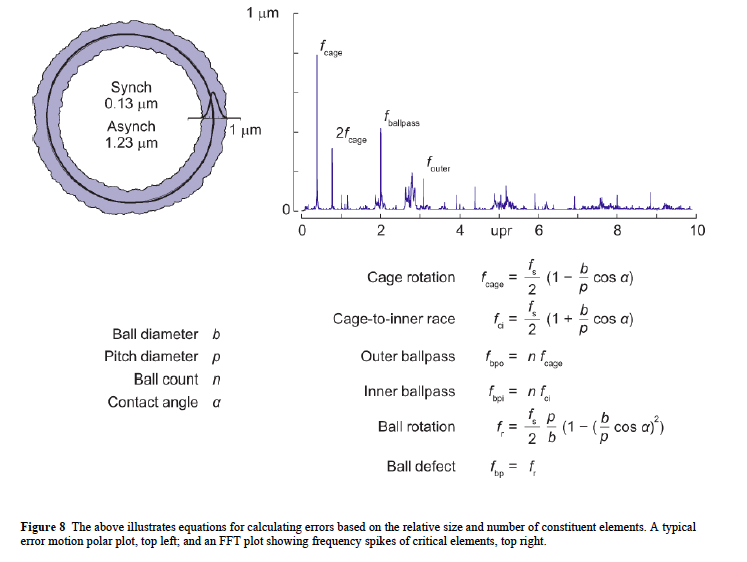 Figure 7 also shows that the error-motion signal may be decomposed into frequency components, and that doing so can result in a better understanding of the factors causing observed motion. For rolling element bearings, characteristic frequency equations can predict error motion encountered during spindle rotation that are a function of the geometry of the bearing components (diameter of races, number of rolling elements, diameter of rolling elements, etc.). The Fast Fourier Transform (FFT) is the most common method for separating the frequency components of a signal. An example of this can be seen in Figure 8 for a single row, deep-groove bearing. Note that the cage, ball pass and outer race frequency spikes are identified in the chart. Rolling element bearings can have nanometer (one thousandth of a micron) repeatability when turning though angles of less than 360 degrees and then returning to the starting position. This is because, in less than one revolution, the constituent elements do not precess. That is, all of the components come back to their original locations with respect to each other. If the error motions of the spindle are plotted for 10 revolutions and then reversed, the error motions will retrace exactly, showing that the error motion of the roller-bearing spindle is deterministic. So the Gaussian distribution shown in Figure 8 across the asynchronous error band indicating random motion is not correct, but is of utility, illustrating at a glance the distribution of the errors in the band. So what are the important take always for gear manufactures. First off, if you are manufacturing gears, take care that the error motions of your spindles are not limiting the quality of the gears you manufacture. The synchronous error motions of your work-holding spindles will determine the roundness, flatness or global tooth profile of the parts you manufacture. Residual face error motion of work spindles can cause flatness and profile errors too. Surface finish is dependent on the asynchronous error motion of both the work spindle and the grinding wheel spindle. Dramatic surface finish improvements can be made by characterizing and improving spindles using Axis of Rotation Metrology. Spindle Metrology offers another tool to use to evaluate the vendors of gear manufacturing equipment, this is the main reason the standards exist. It is how the manufactures of metrology equipment qualify their machines, in a continuing search for improvements, applying these standards to manufacturing equipment is the next logical step. Sometimes the sources of variances in gear teeth contact, surface finish or noise levels can be difficult to identify, Axis of Rotation Metrology presents techniques that can be used to understand the system where a gear is operating. For instance these metrology techniques can be used to separate the error components of the bearing supporting a gear; this would be “Bearing Error Motion” in the standard. The shaft or structure supporting the bearing is also likely being influence by forces transmitted though the gear or another nearby load path (this is “Structural Error Motion” in the standards). 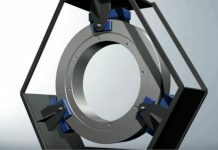 Basically even a 2 meter diameter slewing ring is an axis of rotation, so the techniques of Axis of Rotation Metrology designed to evaluate spindles may be use to understand the dynamics of gears mounted on even the largest bearings. The techniques are a powerful tool in identifying where the most cost effective improvements can be made. If you are using oil hydrostatic or air bearing supported work tables your gears may have lower profile errors then the error motions from the rolling bearings they are mounted on in use. Don’t let your gear be blamed for noise that relates to a frequency associated with the rolling elements. Air bearing spindles are an excellent metrology standard, they are the basis of most roundness measuring machines. The large gear industry may do well to consider metrology tools based on air bearing spindles that may be brought to the part rather than taking the parts to a very large and expensive Cartesian metrology machines (conventional CMMs). The design below contemplates a light weight, mobile measuring system that would index to be co-axial automatically to within a few microns of a machine tool work table via a kinematic mount. The measuring machine would then act just like typical CMMs with regard to software and probe systems. The part could be measured as machined and again after the unclamping from the fixture to understand chucking distortions and avoid trips back and forth between the machine tool and the CMM. The measuring machine could be moved from machine tool to machine tool or to a dedicated measuring station. In some cases it could attached directly to the part to be measured. This when manufacturing large round parts this would be a powerful way to increase measuring flexibility, measuring precision and reduce costs at the same time. 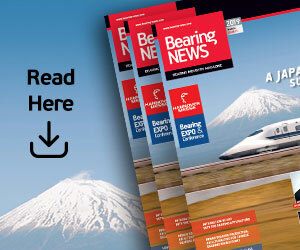 The author, Drew Devitt, is the Founder and Chief Technology Officer for New Way Air Bearings, Aston, PA, USA. 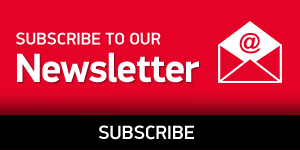 ddevitt@newwayairbearings.com He is past president of the American Society for Precision Engineering, and wrote this as a member the Bearings Specialist Association,Education Committee. Bryan, Jim. “Spindle Accuracy,” American Machinist, Special Report No. 612, Pages 149-164, December 4, 1967. Bryan, Jim. “Tutorial On Axis of Rotation,” Annual Meeting of the ASPE, November 1, 1999. Holzhauer, Wolfgang. “Tutorial On Axis of Rotation,” Annual Meeting of the ASPE, November 1,1999. Marsh, Eric R. Precision Spindle Metrology, DEStech Publications, 2008. Moore, Wayne R. “Foundations of Mechanical Accuracy,” The Moore Special Tool Company, 1970. 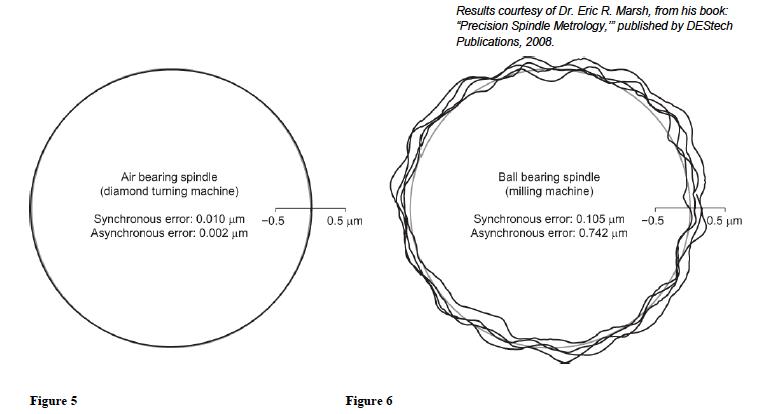 Donaldson, R. R. “A Simple Method for Separating Spindle Error from Test Ball Roundness Error,” CIRP annals volume 21/, 1972. The author would especially like to thank Jim Bryan and Eric Marsh for their effort and input in this work.